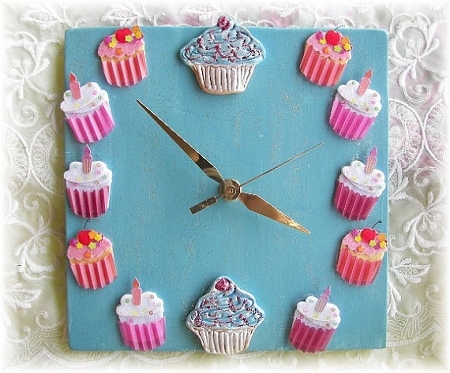 This is an 8x8" square ceramic clock, a bright turquoise blue with a light wash of glitter. Cupcake stickers where the numbers are, adorable for any room. I pour these from a mold and fire to bisque, then add the layers of color and glitter . Handmade cupcakes at the 12 and 6 and paper ones as well~very cute for any wall~I make alot of these and each one may vary slightly.